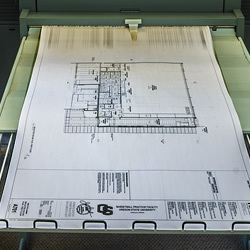 Construction Documents - Salem Printing & Blueprint Inc.
We pride ourselves on quality high speed production with six state-of-the-art printers that have the capability of copying up to 36” inches wide with a nearly unlimited zoom range. Our guaranteed quality production and attention to detail is vital for the success of architects, project managers, engineers, construction foreman, estimators, and safety crews. Medias include: Bond, Vellum, Mylar, Clear Film, Presentation & Colored Bond. Monochrome and Full Color Scanning Services. We also offer Digital Project Archiving, Document Management and Distribution. We operate two high speed toner based KIP C7800 full color production printers. Capable of printing black & white and full color mixed sets. Full color construction documents are known to reduce errors in the bidding and construction process. Our toner based full color prints are very affordable and the image is extremely durable out on the job site. 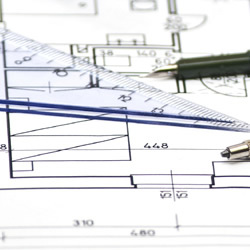 We offer a full line of paper and supplies to the Architectural, Engineering, & Construction markets. From monochrome to color we stock a wide variety of plotter paper. We also offer a large supply of HP ink jet cartridges, drafting materials, mailing tubes, plan covers, and supplies for large format copy equipment.